Hotter today as the high pressure area is still along the coast. Some areas of the north valley will near or at the 100 degree mark. Tuesday the high pressure area will begin to weaken as a couple low pressure troughs push toward the Pacific Northwest. The first of these systems move inland late Tuesday and early Wednesday. Tuesday temperatures will be a few degrees cooler with clouds and isolated light showers near the Oregon border Tuesday night and Wednesday. The late Wednesday and Thursday system will be a little stronger (see map below). Wednesday afternoon through Thursday afternoon the north state will be partly sunny to partly cloudy with a few showers over Trinity, Siskiyou, higher elevations of Shasta, Modoc, and Lassen counties. Temperatures will be cooling and by Thursday will be 4 to 8 degrees below normal. 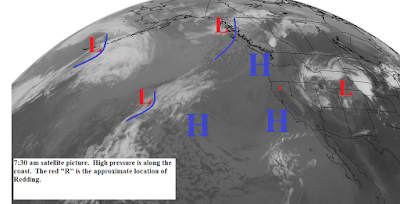 Friday high pressure begins building along and over the west coast. Friday through the weekend looks clear and warmer with temperatures above normal by Saturday. Winds will be light.